Exploring the world wide web for sites suitable for children. My Photoshop is on the blink for some reason since my last post, which makes posting a tad difficult since visuals are integral to my site descriptions. But it occurred to me today (insert lightbulb cartoon here) that I could still talk about sites which do not have much of visual interest anyway. I can always insert the one mandatory photo later. What is the site about? Basically about water - its properties, its behaviour, its conservation, but in a format useful for teaching children. The site is very well designed - a simple easy to load format so necessary for the uncertain web connections here, a clean uncluttered look, easily navigable and fully functional links! (Compare that with some of the Indian government sites!) I am particularly impressed by the duplicate menus - one of the left side and the other on the top, which means you just can't be confused, and the very helpful 'will-open-in-new-tab/window sign for the links which do so. Instead now, get your child to start with 2.2 l of water representing the whole of earth's water in a large container. From this, remove 12 spoonfuls of water into a smaller bowl - this is all the fresh water we have. From this again, 2 spoonfuls for ground water, half a spoonful for fresh water lakes and one drop for rivers. The water left in the large container is in the oceans, and the water left in the smaller one, is in icebergs - so this last collection of 2 and a half spoons is what we can use. Much more effective way of getting the point across, especially for a child, don't you think? This is just one of the activities on the site. Check them all out! In addition to these activities and experiments, the student section further gives out water related projects, working models and movies. Bet you don't know how to make a working water pump with two straws! (If you are one of those rare species on earth you do, please don't tell me!). Or from one. I haven't checked all of these, but majority if not all of these models, appear to be from Arvind Gupta's site, which I had featured earlier here. Also, for those interested in actually doing something at their schools (or homes), here is a section for Principals! It provides handy tools like power point presentations, water usage or savings calculators and step by step guides for water audit and harvesting. Librarians can take help of the listed book and films to add some to their domain as well. Stumped for ideas still? The water week section has quizzes, plays, jingles, haikus, debates, ads and guest lectures for you to be inspired by. PS - To summarize, an excellent resource for teaching children all about water. Although it is India based (a rarity in the online world of resources), its resources are for universal use. I know there are no games here - but my own priorities have been changing since I started this blog, and an excellent resource like this I couldn't pass up! Thanks to Pratham for introducing me! Note: I have covered TumbleBooks in my last blog life (its here), but going through the new books, I thought it worth sharing again. And also, for MoziEsme, who asked about books on the net on her winning blog, Winning Readings. This home page for the TumbleBook library may look kind of stark, but don't make the mistake of underestimating this site! 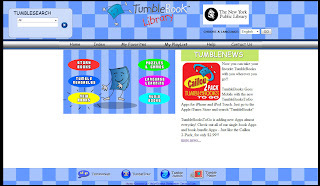 TumbleBooks are 'animated, talking picture books' which are 'created by adding animation, sound, music and narration to existing picture books in order to produce an electronic picture book which you can read, or have read to you.' As of now, they have around 300 books in their collection, and like gmail, the number is growing all the time - well, not perhaps by the second, but growing nevertheless. Apparently they started off in 2004 with only 17 books (source this article at Free Library)! The collection, while not exhaustive yet, is varied and has both fiction and non-fiction books, thus making it a great resource for introducing young children to non-fiction. The expected audience for these books is mainly elementary and primary school kids. When you browse the collection (in alphabetical order according to author or title or newest first), you can either just look at the covers, or see the details (as above). In addition to a summary of the book along with author, illustrator and publisher information, you also get the 'tumbletime', reading level - whether self read or read to, and links to book reviews. Books which have literacy games or puzzles associated will have a puzzle piece icon in the right upper corner. Click on the name or the thumbnail to start reading the book, which opens in a new page or tab according to your browser settings. 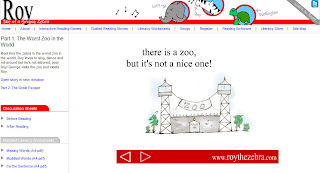 No matter how many books we read, I never get tired of this little fellow tumbling on the screen while the book is loading - which takes a surprisingly small amount of time on a broadband connection! Once loaded, the default is the accompanying audio to start automatically. However you can easily shift to the manual mode or just shut the voice off. However, even in the manual mode, the text will continue to be highlighted as if being read. There are no page turns, but the change of scenes is animated, as are some parts of each scene. Note that this means there are some differences from the original book - not in text, but which text accompanies which drawing, and which part of the page is focused on. On the other hand, this method does draw you into the book, into the telling of the story. I recommend reading the book before or after watching a TumbleBook, so as to not dilute the encompassing experience. The games open in a similar window/tab, load similarly and are fun to play after reading the book - though not if the kid hasn't learnt to read yet. In addition to the animated story books, they also have read-along chapter books (with audio) and high quality readings of classic books for the older children. I have only glanced at these, not having any need to exhaustively explore these yet, but I am sure they would be fine too. Only nothing quite compares to the pleasure an animated book gives a small child, doesn't it? The only drawback is that the site is not free - but it has a 30 day free trial! Although at no point it specifically excludes individuals from becoming a member, the site focuses totally on library and school memberships - to whom they give unlimited remote access at $400 per year. An excellent reason to badger your library to provide TumbleBooks if they don't have it already! Teachers will find many useful resources such as allowing kids to use this at home, an online player for non stop story telling, searching not only by books but also by reading level, quizzes, book reports, lesson plans and worksheets, the ability to mail TumbleBooks (or TumbleCards) and also record them in your own voice, and downloadable icons and buttons. (Also a couple of desktop backgrounds - go to the Admin section for downloads). These resources are of course open to anyone on the site, except lesson plans and quizzes I think, which are only for schools. 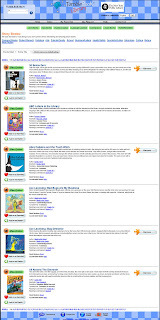 TumbleBook library, TumbleBook readables and TumbleBook talking books form the digital media division of TumbleWeed Press, Inc, a Toronto based children's books publisher. PS - Final opinion? Great site to keep the kids busy for a long time! No ads, lots of books and nice animation. Of course, I am always biased towards anything Book-y! It is very well designed, avoiding the cluttered look even while holding a lot of information on the home page. The colours are easy on the eye and the graphics cute. By and large it loads quickly but songs and the stories can take longer if you don't have broadband. 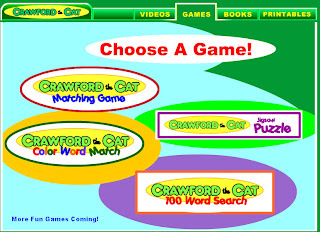 The flash games are listed by levels - word or sentence, and then further according to the object of the game, eg. alphabetical order (as above), use of long phonemes, or singular/plural. 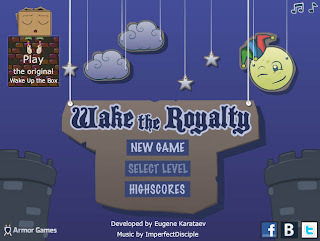 The games are appealing to children, and are designed to fit into school curricula well. Each theme has the same graphics, which is fine, but when this gets repeated for different themes, it becomes a tad boring. Be warned that some of the games have this text splashed all over the screen - 'Available for download only'. It can still be played but is not so interesting, nor easy to read for children. However, lesson plans are given for each theme so even these games are useful as a guide. 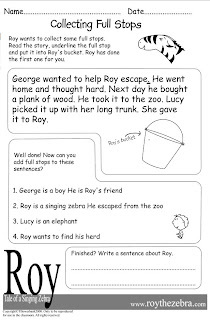 And finally, there are free printable literacy sheets in pdf format like the one above. Simple, but a good resource to have. 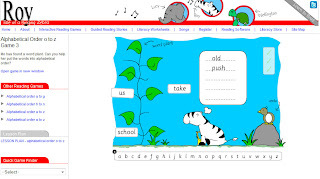 The reading software for purchase includes lesson plans, flash cards, worksheets and other printables, and games of course. So far there are four - two each on long phonemes and tricky words, but hopefully there will be more soon. PS - The final opinion? A wonderful site which you must explore by yourself, for describing it seems rather lame but using it is a different matter altogether! The content and the site both are great. 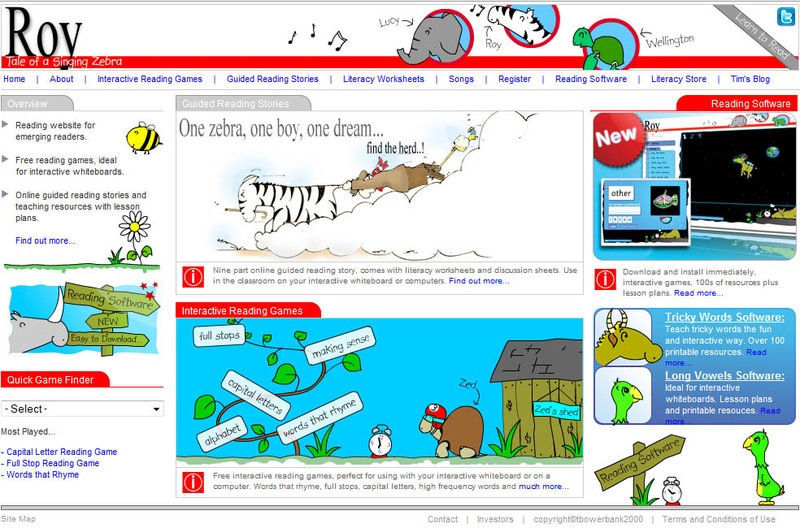 Our last use of the site was more for fun - before my kid was reading, so I am looking forward to using it again now. My attitude to various game sites on the net so far has been of - well, distance, if not revulsion and suspicion and of moral superiority (though that is hard to explain even to myself). Game sites, not the sites where little children can play games. But lately we have somehow found ourselves playing a few games which are hosted on such sites, and about whose safety I can not really vouch - are there viruses there, is someone hiding behind the game to hijack my computer? As I explore this world slowly, I hesitantly post a couple of the games we enjoy, as an aside, for your indulgence. 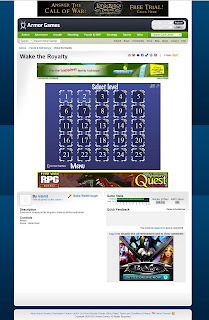 The one problem with all such game sites is that they are not kid safe. There is no way I can let my child alone on that site, clicking on useless ads at best, dangerous at worst, or going on to games totally unsuitable for age - or simply unsuitable. As you can see, the page design in nothing worth speaking of: no aesthetics, no apparent ergonomics. Just games, for your addiction, like a drinking hole. 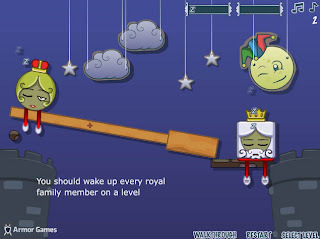 For all that, these two games - Wake up the box and Wake the royalty are cute, and encourage problem solving and reflect the real world physics. 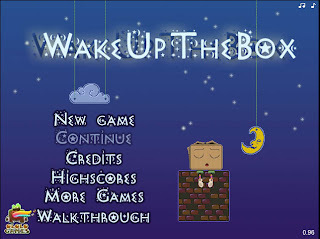 Wake up the box is created by Eugene Karataev and Alexey Egoshin (art). 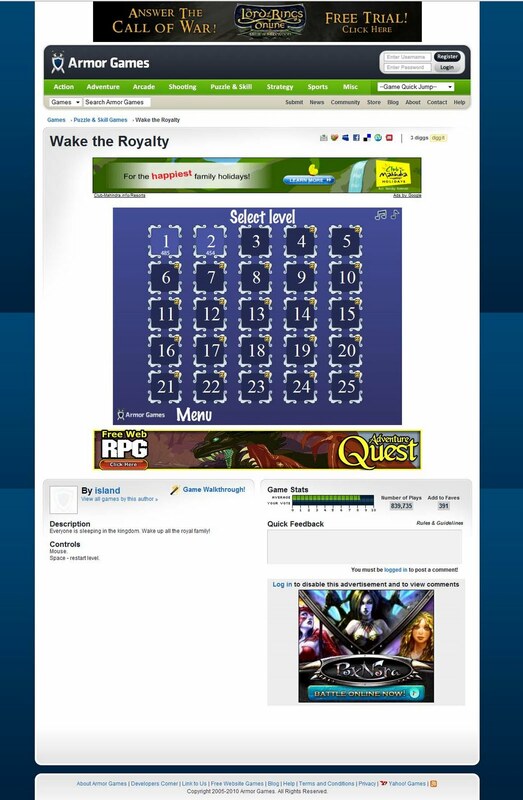 Wake up royalty doesn't have any credits mentioned, and is on a different site, but I think it is the same team. 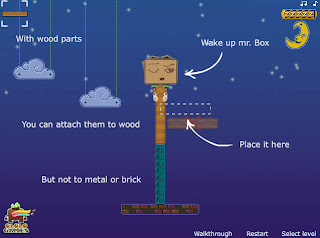 The premise of both the games is the same: a 'box' is sleeping - wake it by moving contraptions so that its resting place either tilts or moves violently. Wooden parts are provided which you have to attach to the given structure to make it unstable. Both the games are well designed, with simple but pretty graphics. 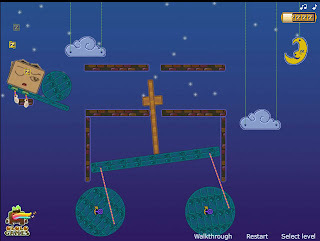 The first two levels teach you how to play the game, and then you are on your own. The physics is simple, based on levers and principles of movement, but it is a challenge nevertheless. And if you are restless, or have a child in tow, it is sometimes simpler to go to the walkthrough for learning the solution! 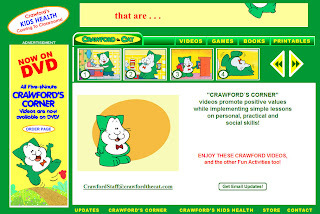 Crawford is a little green cat created by Perennial Pictures Film Corporation. Why green, I have no idea unless it be to distinguish him from the average cats we meet lazing around in the sun. For this cat is clever, and he is Good, as in the good we want our tiny tots to be. He tidies his toys, brushes his teeth and washes his hands. And so on. But he is also quite likeable and not overtly preachy, so kids do enjoy watching him. The site is simply designed, with easy tabs at the top. 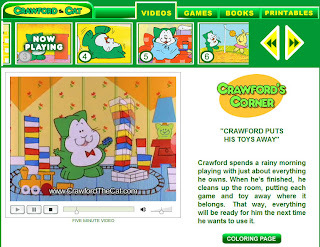 The two adverts that do show are basically about Crawford only so it is quite safe to let kids loose here. There are four games, with promise of more to come. 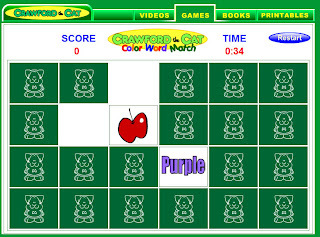 The word search game is for slightly older children, who can read well, but the color word match game is quite suitable for beginning readers, or even younger kids, because the word is coloured accordingly - see below for example. There are thirteen videos at present and they are currently the main attraction of this site for my young 'un. Each lasts for five minutes, and focuses on one educational theme like hygiene, exercise or politeness. As I said, the tone is not preachy and Crawford is fun to watch. As of now, there are six books - turn-the-page e-books with the option of being read to you or reading yourself. The text is simple, and follows the same principles as the videos. There are also some free printable colouring pages, related to each video. PS - Here is the final opinion - Great site for toddlers, preschoolers and kindergarteners. Content is excellent, and concise. Website layout is friendly and doesn't take very long to load even on dial up connections. Back. After ever so long. Apologies and other explanations in the 'About this blog' page. And now, to get started.